Greetings, Stampers! The holidays are going to start creeping up on us soon, but it certainly doesn't feel like it here in NY. The last two days have been close to 90 degrees. Today is supposed to be a little cooler, and I hope drier. The inspiration for today's holiday card comes from all over the place. The colors are from the Merry Monday challenge. 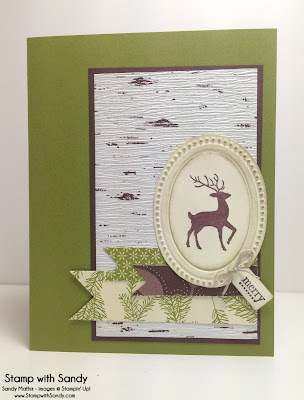 The layout is from an old Freshly Made Sketches challenge which I've used several times, and I was inspired by my stamping buddy LeAnne to use birch paper in my project. 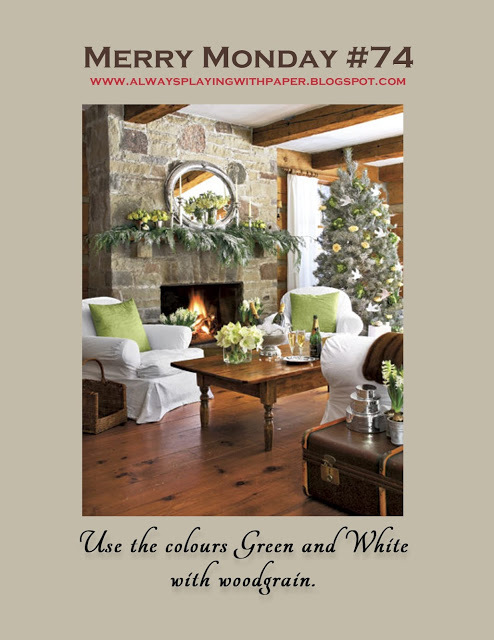 I had to play along with the challenge at Merry Monday this week, which is to combine green, white and woodgrain. I love a Christmas Card in woodland colors! Remember this post when I talked about hoarding my scraps? Well, I'm still working on trying to finish up this bag of Merry Moments DSP. I used only the littlest of scraps today. At this rate, this bag is going to last me a long time! My goal is to try to finish it up this year before Christmas, though. Do you think I can do it? The deer was stamped onto Very Vanilla paper with Chocolate Chip ink, and punched with the Extra Large Oval Punch. The pretty frame was made with the Designer Frames Embossing Folder. I sponged both with a little Crumb Cake ink. Gorgeous! Love the large panel of birch paper. This is really pretty! Great take on the inspiration photo! What a lovely card. Very elegant and festive. Wonderful card Sandy, I love your take on the challenge. Thank you for joining us for Merry Monday this week. LOOOOOOVE this, Sandy! 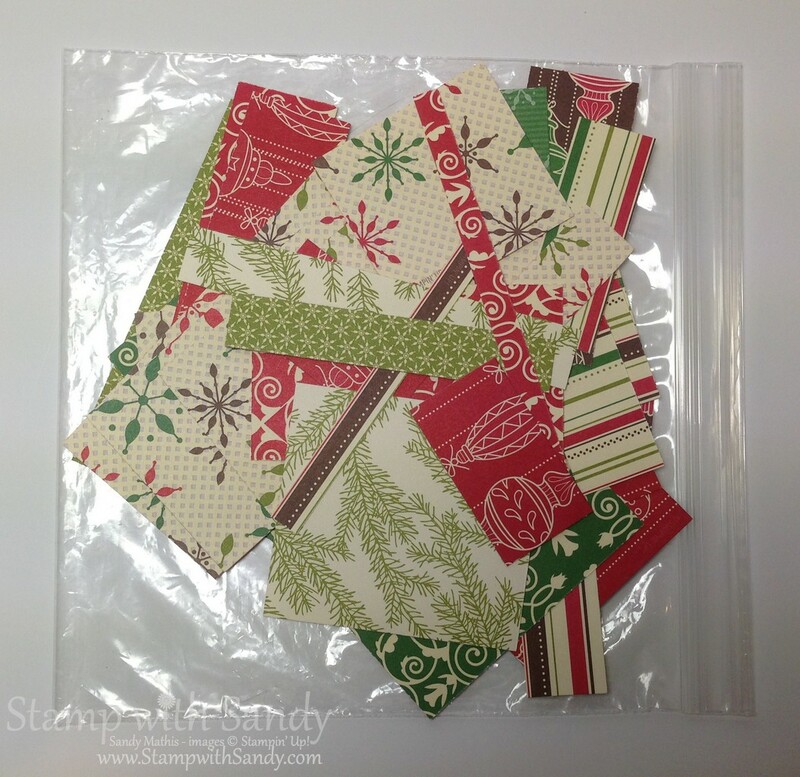 What a great way to use up those scraps. You are more conscientious than I am....most of mine that size go in the trash! 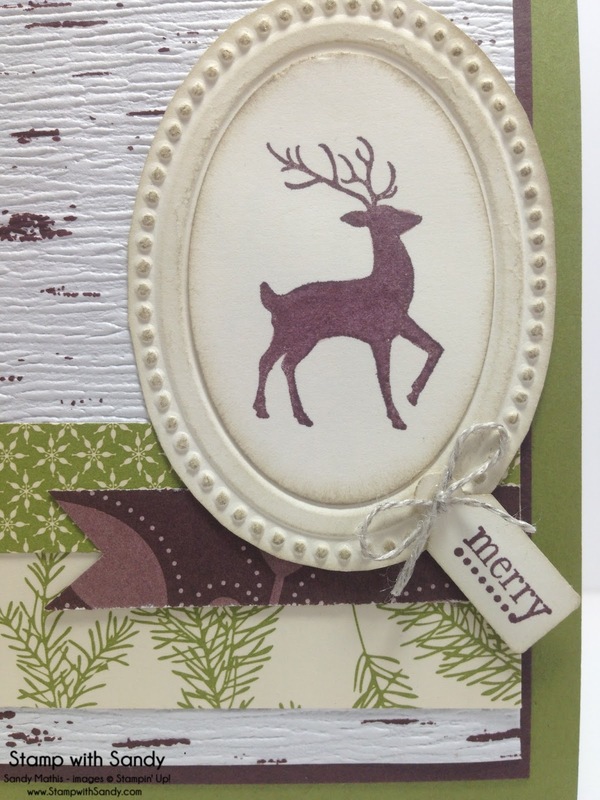 And I just love anything with Dasher as well as that sweet little embossed oval frame! Thanks for playing with us this week! Love it all! From the great background to the gorgeous frame, and the darling deer! Wonderful! This is an absolute dreamboat of a card, Sandy! Well done on using up those scraps!! Thanks so much for joining us at the Merry Monday Challenge. Oomph this is so beautiful!!! Love this so much Sandy!! I can see you doing sets of this with other scraps with other colors and it be just as brilliant too! Gorgeous card, Sandy! You've reminded me that I have that embossing folder and have neglected if for too long. Stopping by from Merry Monday. Your card is one of the loveliest cards I saw there! Love the work you did on the punched oval. I love this deer in the embossed oval frame and the birch bark paper! Good job on those snippets of paper! I still have some of it too! 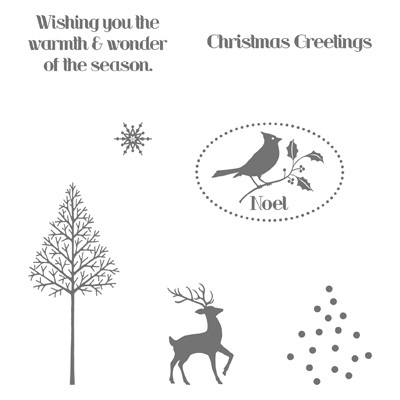 Thanks, Sandy, for bringing this lovely card to share with us at Merry Monday! Gorgeous card Sandy, love all your design elements, but especially the Birch paper. Thanks for joining us at Merry Monday. This is such a beautiful card, I want to use this design for one! LOVE the birch paper. I was wondering....did you just cut out with scissors around the polka dot embossing frame? I don't seem to have a die or punch that fits around the outside. hmmmmmmmmmm..........anyway.....Just Beautiful!